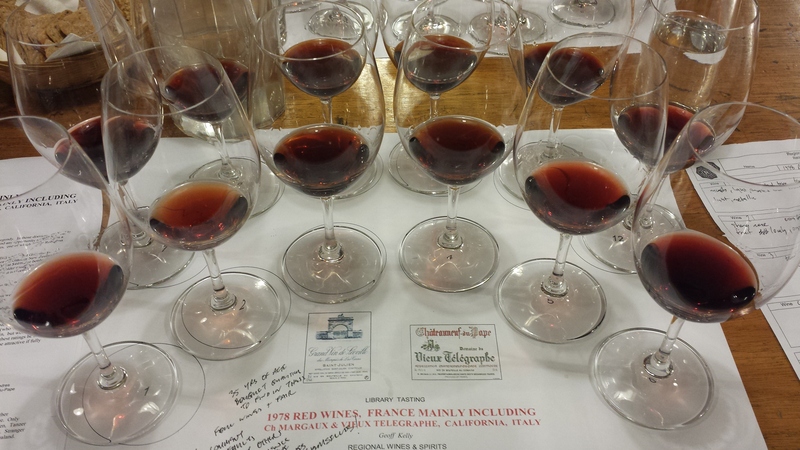 In early April, Geoff Kelly presided over a library tasting of wines from 1978, plucked from his own cellar, and hosted by Regional Wines. Mainly from France, the list included Ch. Margaux, Ch. Palmer and Vieux Telegraphe, and there were two wines from California and Italy also. I know very little about French wines, never mind from the very fine end of the spectrum, and so I was looking forward to it very much. I am beginning to truly love and appreciate old wine, so this opportunity was one to greatly anticipate beforehand, and treasure in the memory afterwards. As a bonus L was able to come along to share the experience with me. Geoff presented all the wines blind, and decanted them into bagged bottles. He arranged them in order stylistically so that the wines followed each other in the most complimentary fashion possible. The bottles were then passed from hand to hand around the room in a stately procession for us to measure and pour into our tasting glasses. We were asked to examine the wines at leisure, then discuss our impressions, and vote for our best and worst wines, and guess what region they hailed from. What I write below is collated from what I thought of them, and what others thought, before and after the wines were finally identified. I’m not going to embarrass myself by attempting a score or valuation, other than to identify the wines I thought were wonderful. 1978 Ch Montrose, Second Growth, St Estephe, Bordeaux – burnt brick red colour; on the nose – musty, dappled, dusty barn, hints of cassis and cedar throughout; light and metallic in the mouth, running out of fruit. An inauspicious start? 1978 Drouhin Gevrey-Chambertin, Burgundy – dark brown-orange burnt brick; strong nose of mature fruit, soft bouquet, fading florals; lovely and crisp and elegant and mouthwatering to taste, burnt caramel. This was more like it! 1978 Ch Trotanoy, top few of Pomerol, Bordeaux – brown red; musty rich nose, tawny, burgundian pinot noir characters, lots of bouquet; in the mouth it was savoury and gamey, long and rich, mouthcoating, with spice at the finish. Merlot dominant, fine texture. Very good. I could get to like this. 1978 Guigal Gigondas, Southern Rhone Valley – magenta brown brick; lighter nose of pink blossom, peppermint. It was delicious in the mouth – balanced and fruity. Amazing for 35yrs! Included a proportion of the very tannic mourvedre grape. GK liked this very much also. 1978 Ch Leoville Las Cases, Second Growth, St Julien, Bordeaux – scarlet brick; herbaceous, vegetal bouquet, with cedar; thin and backward, metallic where the fruit has receded, acidic finish. Too much acid / oak. I would say no to a refill of this one. 1978 Ch Pichon Lalande, Second Growth, Pauillac, Bordeaux – hints of biscuits and a certain degree of oxidation, leathery bouquet; in the mouth, along with delicious fruit, I saw meaty casserole characters here. 1978 Dom. Vieux Telegraphe Chateauneuf-du-Pape Southern Rhone Valley – Dark red brick; meaty bouquet, hint of doctors waiting room; rich fruit character, lovely and vibrant, with lots of tannins and structure, some casserole characters later. What a good way to finish! Wow. What an experience. These wines, to my mind, were mostly amazing. A real education for my palate. I’d never think wines of such age (35 years) could still taste so fresh, and delicious, yet have the complexity from all that age to complement and enhance the fruit character. Now I know why writers make such a big deal about some of these wines. 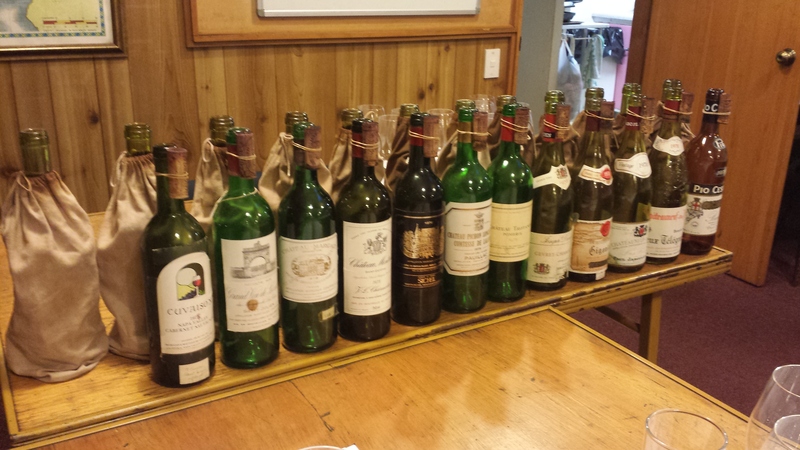 I was really glad to drink the Margaux – my first premier cru. To Geoff Kelly: thanks very much! This entry was tagged 1978 Red Wines, Ch. Margaux, Geoff Kelly. Bookmark the permalink. Wow. Just wow. What an incredible event! Glad to read that they were (mostly) still alive! What a wonderful evening, and a great learning and tasting event. It sounds like you had a wonderful time. I did. Not to be repeated I think! Reblogged this on Cool Climate Wine. Yes we were quite fortunate about that. I have heard that Geoff’s cellar is perfect for keeping wine! Good to see that 1978 is still going strong. It was a great year, not least because it was the year that my wife and I got married – and we’re still going strong, too! Good to hear! Those wines were a special experience I’m unlikely to repeat.